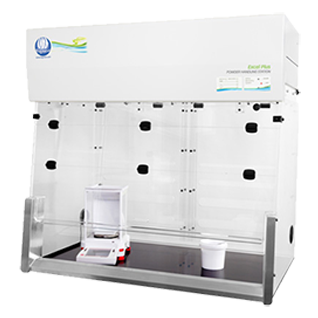 Excel Plus cabinets are for precision weighing applications - for protection from particles whilst weighing and handling powders. These cabinets incorporate airfoil technology and graded rear back baffles ensuring reduced turbulence and precise control of air flow across the entire width of the working access. Acrylic construction and angled clear front windows enable excellent vision of enclosed manipulations and comfort during use. Black base tray is manufactured from PVC. Cabinets are supplied complete with HEPA filtration (removes particles greater than 0.3 microns with an efficiency of 99.997%) and pre-filter (removes particles greater than 5 microns). The mild steel fan housing is epoxy coated. Transparent panels are manufactured from 6mm clear cast acrylic which is non-flammable, resistant to corrosion and easy to clean. The base tray is manufactured from PVC. All right Reserved © 2017 | Science By Design.